Everything about the jungle is totally wild, just like this Novomatic video slot. Totally Wild has 3 rows and 5 reels and everything about it celebrates the jungle! From the backdrop to the logo, the symbols and the sounds – Totally Wild pays tribute to the wilderness of the jungle. Jungles are found in the tropics. While it’s not technically a scientific term, jungles are like rainforests except they’re even more dense. In fact, the term ‘jungle’ is used to describe tropical forests, rainforests and cloud forests. The wildlife you can find in the jungle varies greatly, depending on where the jungle is located! In South America, the jungles are home to monkeys, anteaters, anacondas, sloths, macaws and jaguars. In Asia, the jungles are full of: tigers, orangutans, cobras, elephants and bears. The reels of this slot stand in front of the thick, deep green vegetation. The reels themselves are covered with lighter green leaves, which makes them stand out. Vines, exotic amphibians, birds and mammals all feature as symbols. So does a lush landscape! 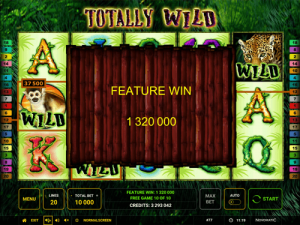 The features that Totally Wild has includes: autoplay, free spins, gamble and adjustable paylines and bets. It’s actually quite a high-paying slot game as well, the RTP is 95.33%. You’ll go totally wild for Totally Wild if you already love to play: African Simba, King of the Pride, Wild Thing, Serengeti Heat, Jungle Queen and Jungle Explorer. All of these are also Novomatic slots which you can play for fun here at NovomaticCasino.co.uk. On our dedicated site, you can read our expert reviews of all the best Novomatic games. Of all the symbols in Totally Wild, the ones which award the biggest payouts are the exotic animals. The other low-paying symbols are typical for Novomatic. The smallest payouts are awarded when you match up the card symbols. These are very common in Novomatic slot games but they’ve got a wild twist in this game. The 10, J, Q, K and A are all covered in vines. This unique touch is just one of many that add to the overall jungle feel of the slot. The 10, J and Q pay up to 5x your bet. The K and A pay up to 7.5x your bet. Moving up the paytable, you’ll be able to marvel at the wildlife! Paying up to 25x your bet, you’ll see the toucan and the frog. The toucan is resting on a perch and the frog is hiding in a flower. The monkey, high up in a tree, is enjoying the sunset. This capuchin monkey pays up to 37.5x your bet. At the top of the food chain, and the top of the paytable, is the jaguar. This pays up to 50x your bet. When you start the game, or when you’re not playing in autoplay mode, you can open the paytable to see these symbols and the payouts they award according to your bet. A payout is awarded for consecutive strings of 3, 4 or 5 of the same symbol, when they land on paylines from the left. The paylines pay one way (left to right) and you can see the paths they take on the paytable. If the identical symbols aren’t enough or they land in positions that aren’t following a payline, they won’t pay out. In these cases, the only symbol that can help is the Scatter symbol. The Scatter symbol in Totally Wild can just like the Scatter symbol Book of Ra pay in Scatter, award Free Games and also behave as a substitute (like a Wild symbol). Acting as a substitute, the Scatter symbol can stand in for any symbol during the normal games. It will do so when it guarantees a win because of the way the symbols have fallen. When it is acting like a true Scatter, it can pay from any position whatsoever! In any spin, 3, 4 or 5 Scattered symbols will award a payout in addition to 10 or more Free Games! 5 Scatters give a payout of x100 your bet and 25 Free Games! While you are spinning the reels for the Free Games, the picture symbols (the toucan, frog, monkey and jaguar) become Wild, too. This is when the slot really lives up to its name and goes totally wild!